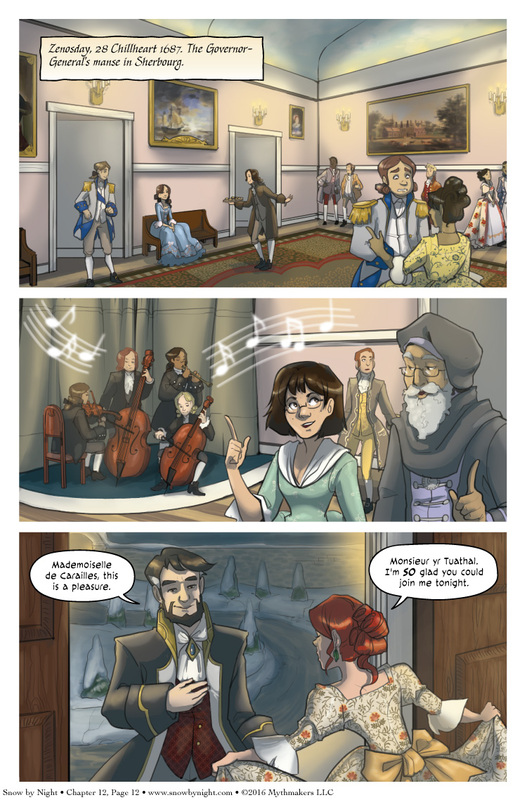 Cue the fancy ball scene on Chapter 12 Page 12. Vivienne gets a lovely new dress and Cienan falls for the bait. Or maybe — as some of you have pointed out — he’s along for the ride and wants to see where this goes. To see what Jassart is up to in the meantime, please vote for Snow by Night on Top Web Comics. Claudine scrubs up well and good to see she’s showing her independence from the dictates of fashion by eschewing the fancy hair-do. Hey, you recognized Claudine. Gold star! The noble’s face in the first scene is hilarious talk about out of his element. Happy Birthday from the World of Corthis! Antoine and Claudine seem to be having a good time, though! I’m guessing it’s because a/e) they aren’t dancing, c) they’re not talking about politics and/or b) they’ve pre-drunk properly.